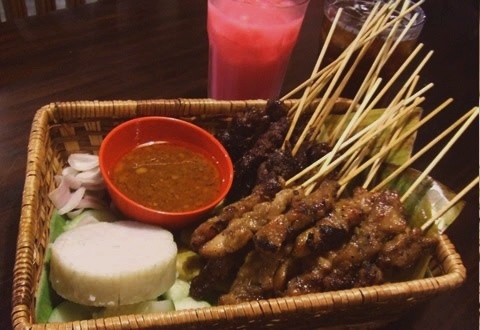 Satay or sate (pronounced /?s?te?/ SA-tay) is a dish consisting of diced or sliced chicken, goat, mutton, beef or other meats; the more authentic version uses skewers from the midrib of the coconut leaf, although bamboo skewers are often used. These are grilled or barbecued over a wood or charcoal fire, then served with various spicy seasonings. 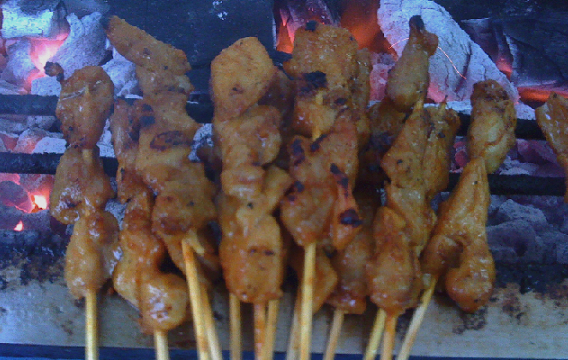 Singapore Malay Satay Recipe. Chicken satay, Mutton satay, Beef satay recipes. Serve satay peanut sauce warm, or at room temperature, in a small bowl as an accompaniment for dipping the satays. It is great for dipping Ketupat, (a Malay rice cake), often served with satay. I want to know how to make the rice block that you get with the satary, cucumber & onions. You show it in the picture but don’t describe it in the recipe. Hi, I’d like to find up how many people can this amount of satay serve? hi, this recipe will be good for about 5-6 paxs. 1lb is equals to appox. 1/2 kilos, which will make about 50 satay sticks. Well, that is about 10 satays per person! I can finish 15 at one go.. Excellent recipe and the result is great. But the recipe itself needs to be edited properly. It’s confusing and does not flow well. Can’t wait to make this….and eat it!! !